Every year ARTspot creates a Painting Challenge to provide an opportunity for all levels of artists to grow, find community, and have a positive experience with their artistic process. Sneak Peek Info: the 2019 painters challenge will be watercolor! Sign-ups will be happening later in the summer. More info to come! thank you to all the artists that took us up on the 2018 challenge. We painted up a storm in april and had a big party in May to celebrate. Here's some pics of our 2018 Painter's Challenge Artists at the Great reveal and Awards Party. If you missed it this year, join us for challenge 2019…. The ARTspot Annual Painter’s Challenge: a proven process that can push you, pull you, ultimately challenge you to help you grow. $60 worth of canvases to get you started! A reveal and wrap up party event with awards and prizes! A chance to show your work at ARTspot! Our goal for you is to complete the challenge with a series of paintings that share a common theme and technique. Sometimes we get in the habit of creating one painting at a time. 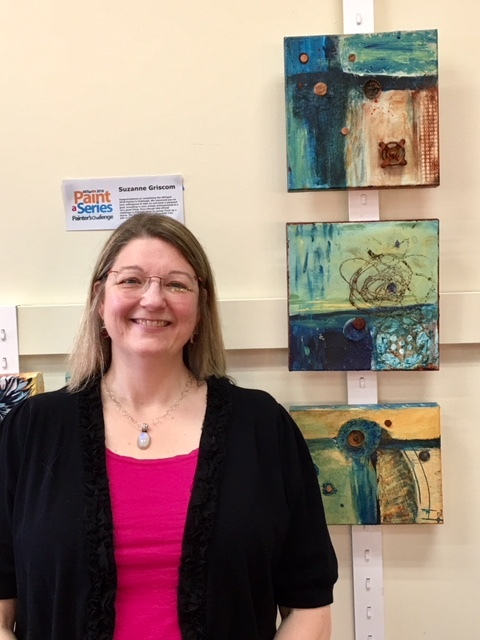 Tracy Felix, owner of ARTspot, painter and instructor says, “I used to put all my focus on just one painting at a time... and was amazed at the difference when I started rotating several canvases during painting sessions. Not only did my productivity increase, but the real advantage was how much my work progressed. Another great benefit was that my paintings showed so well together in groupings and art show settings." This is the goal of this year's ARTspot Painter's Challenge: to bring a series of paintings forward as a group. The final result is a thoughtful and cohesive body of work. Once you sign up, your personal challenge has begun. Come in to ARTspot to pick up your canvas, choose your medium, and start painting. Take pictures of your work in progress and send them to us! We will post them on our specially created Face Book album to share your progress with the world. Don’t stop painting! The world WILL be interested! Paint as many canvases as you wish to create a series of paintings that share a common theme. there are no rules how you go about this. You can use any media you want. You can use acrylics, watercolor, oil paints, mixed media, encaustic or pastel. This will be the time to hone in on your personal style, the "voice" in your own original artwork, and dial in your technique. Read on for more details, followed by a Q & A. We Offer you lots of support through the process. We will provide $60 worth canvases to get you started, a mid-challenge group review session to help you decide how to finalize your series and plan your presentation, a discount on art supplies during the challenge, AND a reveal party at the end of the challenge with awards and swag. ALL this is included in the $150.00 registration fee. Tracy has also put together a weekend workshop you can purchase in addition: to be held April 7-8 at our sister studio at Cole Gallery. Take one or both days of the workshop to kick off your Challenge series with step by step instruction. The workshop is a separate offering, and is NOT required as part of the Challenge, just an extra if you would like to do both. Sign up for the workshop HERE. You can sooooo do this. ARTspot owner Tracy Felix's 3' x 4' paintings. You can work big or small.... or mid-size. Just Do It! Advice and encouragement from the staff at ARTspot on how to work with your medium of choice. A great opportunity to experiment with new ways of using your art materials. Mid-Challenge Review Session Tuesday May 1st, 6:30-7:30 pm. Bring your work that is still in progress to Cole Art Studio and receive advice from ARTspot Owner, Tracy Felix and Cole Gallery owner, Denise Cole. We will give you pointers on how to finish out your paintings, which three are your best choices for the Reveal Party, and framing advice. 10% off on all art supplies at ARTspot from the time you sign up until the day of the Reveal Party on May 12. We will post your progress and final images on a FaceBook Album. We have nearly 1,000 people following us on our ARTspot Facebook page! If you "Share" these posts your own page then your fans and families can follow your progress too. Having a Facebook account is not required, nor is participation in documenting your work with photographs. We have found this to be a very fun part of the experience, and highly encourage you to participate!!! Technical advice on how to take digital images and email them to ARTspot. The easiest way to do this is take a pic with your smart phone and email it to artspotchallenge@gmail.com. "Day of the Great Reveal" Celebratory Party : Saturday May 12, 7-8:30 pm. Bring your three best paintings to display. Awards at 8:00 Including, but not limited to, awards for: Most Advancement in their Art, Strong Voice in Your Work, Best Use of Your Medium, Best Presentation, AND Selecting an artist to show their series in the front windows of ARTspot! Be sure your paintings are wired for hanging!! 1. Do your very best to complete 3-5 Paintings in a cohesive series. You can do this in any style you like, from non-representative, to abstract, or any traditional style of painting. You will have from the time you register to the day of the "Great Reveal Party." 2. Optional: Document your progress with a digital camera or smart-phone and email jpegs to ARTspot. ARTspot will take it from there and get them posted online. Artist's are not required to have a FaceBook account. Taking on a challenge is a great way to grow as an artist! At the end of this process you will be a more powerful and confident painter. YOU CAN SO DO THIS! Register right here on the ARTspot website, call us at 425-640-6408, or come in to ARTspot to register and pay the fee. You will need to come in to choose your $60 worth of canvases to get started. What if I cannot complete a series? We just ask you to do your best. Once you get in the swing of things you may find it more doable than it seems at the beginning. This is NOT a "Painting A Day" -- you have from the day you sign up to the day of the "Reveal" Party. It is not required to complete any given number of paintings, but we would like you to bring in the best three in your series for the Reveal Party. These are the paintings we will jury from for awards. So if you complete only 2 or 3, we will celebrate your progress just the same. It's all good! What kind of canvas will I get? Do I need to sign up for the free critique session? This mid-challenge event is designed to give you a chance to meet the other artists and see what everyone else is working on. Denise Cole and Tracy Felix will be on hand to review your work and give you specific feedback on how to finish your series and which pieces to plan to bring to the Reveal Party. Hosted by ARTspot’s sister studio, Cole Art Studio. Located at 107 5th Ave S. Just a half block away from ARTspot. Registration is much appreciated but not required. Call ARTspot at 425-640-6408 to RSVP, or you can RSVP as part of the registration process. What does the 10% off include? 10% off at ARTspot from the day you register to the date of the Reveal Party when the Challenge officially ends. Discount applies to all art supplies as well as all art, jewelry, paintings, and art books. The only exclusions are clearance items. How do I document my paintings? To take digital images you will need either a digital camera or a smart phone, and access to the internet... or a really good friend or spouse to do this for you! It is a super useful skill to have, so this Challenge will have the additional benefit of getting comfortable documenting your artwork. Here is a YouTube video on how to photograph your artwork with a digital camera. This video is excellent. You can use the same tips for using your camera phone. Camera phone images are fine for the Challenge... and you can easily crop them to show just the painting, and send it as am email directly to ARTspot at artspotchallenge@gmail.com. It will be a fun evening to come share your story and meet everyone else who has completed the challenge. Bring the 3 best paintings from your series to display! ARTspot and Cole Gallery will provide a few light refreshments, some wine and non-alcoholic beverages. Artists are asked to bring beer or wine, and a light appetiser, but this is not required. We sure DO hope you can attend as it will be a memorable evening! You are welcome to bring a guest as well. Party limited to the first 50 people to RSVP. You can RSVP as part of the registration process, or call it in later. What if I can’t come to the "Day of the Great Reveal” party? Attendance is NOT required as part of the challenge. The awards will be juried the night of the party from the work displayed. If you can arrange for another artist to bring and hang three paintings from your series, we would be happy to include them in the awards consideration even if you are not present. Sorry. There will be no refunds or credits back for the $150 fee. Even if you cannot get to the painting part, you are still welcome to choose $60 worth of canvases, and take advantage of the 10% discount on any other purchases at ARTspot from the time you register until May 12, 2018. And heck, come to the party too!